My Chinatown is a deeply personal account by Kam Mak, who grew up in New York’s Chinatown. 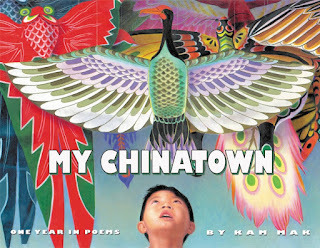 It explores a boy’s first year in the United States—after emigrating from China—as he grows to love his new home in Chinatown through food, games, and the people surrounding him. The streets come vividly alive through Kam Mak’s spare verse and richly detailed artwork.